Taskmaster has photographic reflexes perfectly copy the fighting styles of super-heroes, and has learned many moves by watching videos of the heroes in action. Considering himself a businessman, Taskmaster opened a mercenary school for training criminals in the fighting arts. This Taskmaster is a definite upgrade over the last one, but the bright blue is garish. 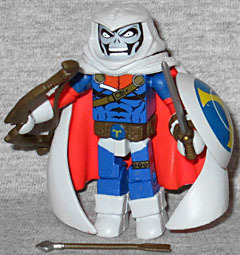 He uses Moon Knight's hood and cape, and it seems to have been remolded slightly, because it no longer comes down lower than the figure's feet. He's got the boots and gloves from various Captains America, including the glove with the built-in shield straps. His shield is still Invisible Woman's dome, plus he's got a sword, bow and arrow. 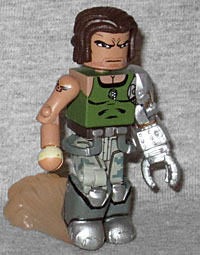 Rad is looking pretty good as a Minimate. He gets big new boots and of course, his mechanical arm, but they also gave him a new belt that includes his dangling suspenders. Neat! The robo-arm doesn't get a wrist, sadly - if it did, they could have given us both a normal hand and a grappling hook hand. His hair is new, but Art Asylum probably didn't make it the same way NECA did. His skintone is darker than average, and his has some subtle stubble painted on his unhappy face. The set also includes a little dust cloud base. It's amusing that in releasing Taskmaster, a character who can copy anybody's abilities, they paired him with someone who has an enhancement he can't easily duplicate. Well, unless he has a grapnel gun. This entry was posted in Art Asylum, Marvel, MMMR and tagged Avengers, Capcom, Minimates. Bookmark the permalink.